Dean Vernon is the Dean of the Mars University, and he loves the "peace and quiet and the respect [he] receives" the most. As a result, he hates Robot House (often hollering "Robot House!" after they'd committed some sort of misdeed). Accordingly, he put them on dodecatuple secret probation. Unfortunately for him, after Robot House won the Big Fraternity Raft Regatta, he was not only forced to take them off said probation, but had to serve as a grand marshall in a parade honoring them. He dated Leela but never called again. Fat-bot ate his precious model ship, which, as he put it, kept him sane for 8 years. Leo and Inez Wong paid him to admit Amy as a student. They also attempted to pay him to get Amy accepted into Phi Beta Kappa. According to Professor Farnsworth, he was involved in some sort of hovercar incident where he claimed his horse was driving the car. Tress MacNeille voices Dean Vernon's unseen secretary. The character is based on Animal House's "Dean Wormer", who was played by Canadian actor John Vernon. 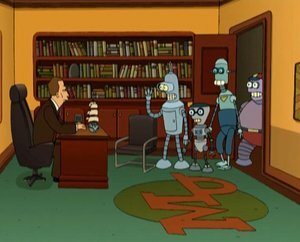 Bender: Now, I can explain that. 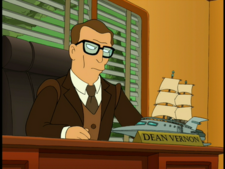 Dean Vernon: That's enough out of you. From this day forth, Robot House is on dodecatuple-secret probation! This page was last edited on 21 May 2017, at 02:34.